Spaghetti is served every Monday night per my husband’s request. 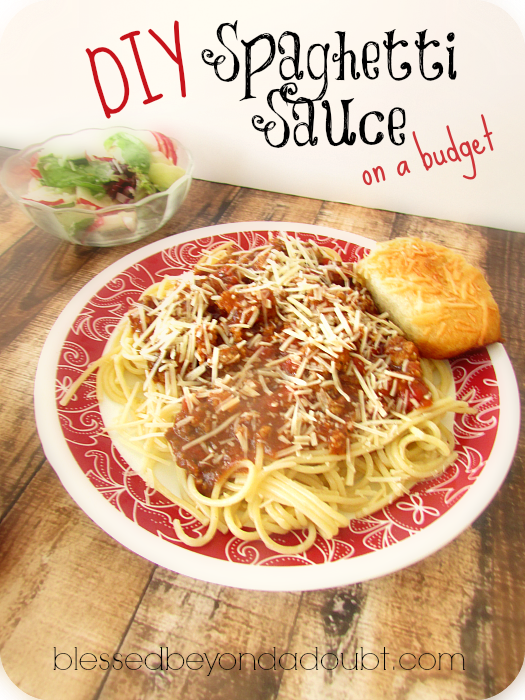 So I knew I had to come up with a tasty recipe for the best homemade spaghetti sauce on a budget. We are a large family of 8, and only 2 of us are females. We eat a lot of spaghetti around here to say the least. We purchase our ingredients at Sam’s for this easy best homemade spaghetti sauce, and of course, the cost will vary per location. On average the total cost for the ingredients including the meat is 15.00. A family of 4 should be able to get 8 spaghetti meals out of this batch. Combine all ingredients evenly in (2) slow cookers or make on (2) separate days. Cook on high for 6-8 hours. Let sauce cool and store in gallon size freezer bags. Lay flat in freezer.This makes about 32 cups of sauce. Thaw out spaghetti sauce in refrigerator the night before and throw it in the slow cooker on low all day. This sauce is a traditional thin sauce, if you prefer a thicker sauce that is found on the grocery store shelves, you can thicken it with corn starch when reheating up sauce in the slow cooker. Of course, spaghetti is always better with these delicious Italian biscuits. Don’t forget to follow us on Pinterest for more homemaking ideas! Be sure to tell us how you like our best homemade spaghetti sauce recipe! Hi. Do you brown the meat first? I realize it doesn’t say to brown it first, but it seems like most ground beef in a slow cooker recipes do call for it to be browned first. So I just wanted to double check before making the recipe. It sounds yummy. Thanks. No, you do not brown the meat first. This is the key to making it taste wonderful. This sounds really good. It has been a long time since I have had really good homemade spaghetti. I’ll have to try it some time soon.